In the magazine: After an absence of 14 years, Honda returns to the winner's podium with a classy sedan. Back in June 2008, when the second-generation Accord Euro arrived in Australia, few could have predicted the turmoil and turbulence that would fill the second half of the year. Rising levels of uncertainty, and the mood of caution that followed, served to highlight the Honda's virtues. Not too big, not too thirsty and not too expensive, it embodies moderation. Yet this sedan is also, as the eight Wheels Car of the Year judges found, a car of great ability, unquestionable quality and superior safety. Avoiding both excess and austerity, the Accord Euro is a car that suits the times. This isn't the reason it's the winner of the nation's longest running and most respected new-car award, however. The stylish Honda sedan also satisfies the COTY criteria, those five time-tested measures of automotive excellence, better than any other car launched in 2008. Blending driver satisfaction, passenger comfort and all-round user-friendliness in just-right proportions, the Accord Euro is an exceptionally well-rounded car. It is, as one judge put it, "a car with very little wrong with it". During the week-long COTY program the judges' appreciation of the Honda's harmony grew steadily. Flaws, too, were discovered, but none were fatally serious. Dynamically, the Accord Euro was outstanding. "A very well-balanced and neutral-handling car," noted Ged Bulmer. This opinion was echoed by COTY first-timer Sean Poppitt. "Supremely neutral, stable and composed," he wrote. "Body control isn't quite as tight as the Mazda 6, but ride quality is markedly superior." Only when driving hard did the Accord Euro's suspension settings cause any concern. "Ride comfort very, very good, but could use a little more rebound control at times," I observed. Mid-corner bumps and heaves do sometimes overtax the rear dampers. Having grown in comparison to the first-generation Accord Euro of 2003, the new model is roomier. The dimensional increases are significant (length 50mm, width 80mm, wheelbase 35mm, front and rear wheel tracks 65mm). Inside, the new Accord Euro's greater interior width is instantly obvious. This isn't the only thing to like. The front seats are superbly supportive and the driving position excellent. Rear seat space and comfort - at least in the outboard positions - is also very good. But getting into and out of the rear seats should be a little easier. The problem is the size of the apertures. "Rear door too small; hit my head getting in, a bit tight getting out," wrote Leanne Tander, smallest of the COTY judges. Bruce Newton too noted the problem. Diligent Newton was also the judge who paid most attention to cargo capacity. "Boot is an odd shape, but sizeable," was his verdict on the Honda. With its 467 litres, the flat-floored compartment is similar in size to the first-gen Accord Euro and also goes awfully close to equalling the volume of large, Australian-made sedans. All the way from instrument panel to bootlid latch, the quality of Honda's interior design, materials and assembly impressed the judges. Every point of contact with the car seemed to have been seen as a chance to impress. "All the dials and controls push, pull and rotate with slick precision and a quality feel," wrote Poppitt. "Quality leather and plastics, beautifully finished." Others felt the Honda deserved comparison with more costly cars. "Impressive interior," approved Robbo. "Why pay more for Euro cars?" There were very few negative remarks on the interior, none serious. A couple of judges thought the ergonomics of the heating, ventilation and air-con controls, and the in-car entertainment system could have been a little clearer and more intuitive. "Too many buttons?" asked Leanne Tander, with good reason. Most judges also noted an increased level of road boom when riding in the comfortable rear seat, but it was generally agreed that it was not as loud as similar noise in the boomy Mazda 6. Honda's decision to make the new Accord Euro's line of descent quite obvious (they even put the same man, large-project leader Hiroyuki Ikegami, in charge of the second-gen program) found favour with the COTY judges. "Nice exterior (and interior) design," was Michael Stahl's pithy summary. Some judges thought the surfacing, in places, would have benefited from more restraint and less complexity. "Styling overly fussy," sniffed Sean Poppitt. But those who thought the car would look better if it resembled its predecessor more were in the minority. There was unanimity on the excellence of the Honda's engine and transmissions. The 2.4-litre four is an updated version of the engine used in the first-gen Accord Euro (and is also essentially the same engine as used in a bunch of other models, including the Accord VTi, CR-V and Odyssey, plus others not sold in Australia). But for duty in the Accord Euro, the relatively long-stroke 2354cc engine is tuned a notch or two higher than in other Hondas. In the first-generation model its max power was 140kW, for the second Honda's engineers liberated an additional 8kW. This six percent jump came from an increase in compression ratio, enlarging valve diameters, revisions to cam timing and improving gas flow through the exhaust system. It's sweet, smooth, responsive and muscular. "Another stellar Honda engine!" enthused Sean Poppitt. "The drivetrain is every bit the equal of the Audi A4's four cylinder." None of the other judges would have disagreed with this flattering assertion. Both five-speed auto and six-speed manual gearboxes also earned plenty of praise. While the new Euro's performance never became a burning issue for the judges, it's actually a little slower than the first-gen. The engine's maximum power boost is more than offset by the weight increases that accompanied the growth in size. These range from six to almost 10 percent, depending on model. Wheels performance tests have confirmed new Accord Euro's poorer power-to-weight ratio has blunted its acceleration. But the extra kilos deliver an increase in body rigidity, something Honda believed the new car needed. Safety, handling, and NVH (noise, vibration and harshness) were the reasons. Testing confirmed success in the latter two cases, and independent crash testing has shown the new Euro does a great job of protecting occupants in an impact. The standard complement of airbags is comprehensive: a pair of dual-stage front airbags, dual-chamber front-seat side airbags and full-length side curtain airbags. But the Honda's intelligently designed body structure, especially its front end, also contributes to its A-grade test results. The Accord Euro's list of active safety technology is also competitively comprehensive, but doesn't work quite as well as it reads. The judges rated the effectiveness of the Honda's driver aid systems as average, the calibration of the ABS coming in for criticism for its dirt road performance. This didn't mean the Accord Euro's stopping was poor in all circumstances. "Gravel braking substandard," wrote Peter Robinson. "Wet bitumen brilliant." The car's standard ESP system - VSA is Honda's marketing name for electronic chassis stability - didn't arouse strong feelings one way or another. It may have been better than some, but it fell short of being the best. Some COTY judges were pointedly critical of the new Accord Euro's chubbiness. One of them was Michael Stahl. "Put off a bit by weight gains," he noted. But fuel consumption cuts provided an effective counterpoint. Both six-speed manual and five-speed automatic versions of the car achieve 8.9L/100km consumption and 212g/km CO2 in the Australian Government's ADR81 test. This represents efficiency improvements and global warming emissions reduction over the previous model of two percent for the manual and five percent for the auto. 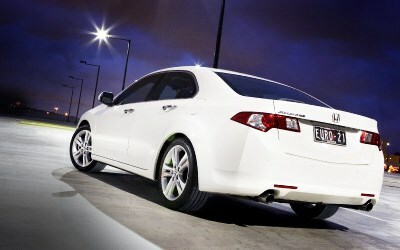 For efficiency and environmental impact the Accord Euro is that bit better than average. Those same words could apply equally to the Honda's technology. Almost everywhere you look, there's something a little superior to the class norm. The engine's impressive specific output, for starters. Double A-arm front suspension, where simpler struts are common. Fuel-saving electric assistance for the rack and pinion steering. But what elevates the Accord Euro well above the medium-car herd is the painstaking attention that was obviously paid to integrating all the separate systems into a wonderfully cohesive whole. Value was never going to be a big problem for the Accord Euro in COTY 2008. The base manual, at $32,990, is competitively priced against similar size rivals from Japan with comparable equipment content. Some judges noted that other respected brands, like Mazda with its new 6, open their medium-car ranges with an even more affordable model. A sub-$30,000 model would spell genuinely superior value, argued Peter Robinson, but others pointed to the fact you need to spend near-identical money on a Mazda 6 Classic to match the base Euro's equipment levels. At the other end of the price spectrum there was little dissent. The Luxury specification Accord Euro automatic, for instance, was judged great value for $41,990. To the base model's by no means skimpy list of standard equipment, the Luxury adds 18-inch wheels and tyres, HID headlights, power-adjustable front seats, auto headlights, rain-sensing wipers and sunroof. The Luxury Navi version, at $44,990 with auto, adds sat-nav and a reversing camera to the list. When the Accord's superb core technology, great quality, polished dynamics, impressive refinement, good fuel efficiency and above-average safety is considered alongside its comprehensive standard equipment, there's only one possible conclusion. As Stahl noted in typically to-the-point fashion: "Near 'Euro' sophistication at 60 percent of the price." Some other judges might have left out the "near". What's certain is that the Accord Euro is truly a happy medium. And a deserving Wheels COTY 2008.